The GO Tech M160 unit installs a “green” solution to reduce the environmental impact of flaring, venting and incinerating. Currently, we offer a product that will help oil companies meet the government standards in both Alberta and Saskatchewan. The GO Tech M160 unit installs a “green” solution to reduce the environmental impact of flaring, venting and incinerating. This units’ system also provides companies with a cost effective solution of maintaining oil production when excess gas cannot be vented or utilized. Cost saving opportunities may be realized on existing gas sources by converting the vent gas produced from the production of oil to Usable Energy. This Unit is Patent Pending in Canada and the United States. The 2” M160 GO Tech Skid Unit is built to B 31-3 specifications. 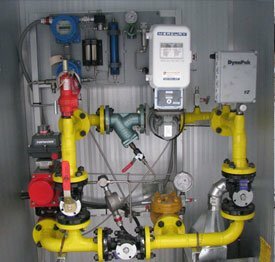 A main use of this unit is to monitor compressed vent gas that is to be sold or transported on to dry low pressure systems. This unit can be built to handle pressures up to 1400psi. This unit will assist oil companies to meet the Saskatchewan Ministry of Energy and Resources Saskatchewan Upstream Petroleum Industry Associated Gas Conservation Directive S-10; and Alberta’s Upstream Petroleum Industry Flaring, Incinerating and Venting Directive 060 Requirements. You can download a copy of our M160 brochure below. The link will open the brochure in a new window allowing you to save a PDF version straight to your desktop. Go Tehcnologies has very good strength in innovative technology and tools with over 65 years of combined experience. We develop, manufacture, install and maintain equipment used to improve efficiency, reduce overall cost, and enhance productivity.